Most of the tours, such as the Subterranean Underground River, Honda Bay and El Nido begin with a very early wake up call. The hotel's reception called us at 6 am in preparation for our 7 am van pickup by the tour agency where we booked our tour with. We were with another family whom we fetched at an inn near the Sta. Lourdes wharf. On the way to the wharf, we stopped by at Panz Mask and Snorkeling Shop to rent snorkeling gears and beach booties. People with non-waterproof cameras can also rent waterproof casings. We were there also to have some light breakfast and hey, what do you know, coffee and pan de sal for free. If you plan to do it on your own without the help of a tour agency, you can hire a tricycle or a van to Santa Lourdes wharf, to get to Honda Bay from the capital of Palawan. The ride takes about 30 minutes. On Santa Lourdes wharf you will find a big hut with tourist office where you can rent a local fisherman boat, or bangka, which can take you to any of the islands in Honda Bay. The boats have their own life vests, I'm not just sure if there is a different fee if you are just hiring a boat man. For first-timers like us, and with kids, I would prefer travelling with a certified tour guide. Not only will you get to learn a lot about Palawan, you are assured that you're getting your every pennies worth, that's just my two cents. We were also able to see the incarcerated Chinese vessel where hundreds of Hawk's bill turtles were found. The tour was very comfortable, with the boat that is big and carries up to 20 people. The current was not rough, thank God, else my kids might not enjoy the sea. We were actually loaded with enough bottled waters for the bunch, cookies and crackers for in-between snacks while on board. If you are traveling with a tour guide, it would be a really nice gesture to share some and to the boatmen, who are so courteous. Before I forget to mention, we also bought packs of bread buns, not for us though but for the fish. As fish-feeding would really be an activity worth trying by the kids. Once we got off the boat, leaving everything but our snorkeling gears and cameras, we were greeted by the clean, ivory sand and calm, clear emerald water and a boy selling ice candy. There are several ice candy boys roaming around some beaches to earn for their school finances. This boy, polite in his ways, is one of them. I don't mind buying from him though, for it's a quick escape from the early morning sun's heat and the milky cold tube were yummy. The "red mongo" flavored was our choice and it may not be enough to buy him ballpens, we hope at least it was one way to lessen his back burden for the day. So, please do buy from them. The ice candies for that day came in two flavors, the ones on the left are fruit salad while the ones on the right were red beans. Luli Island is sandbar in Honda Bay which has garnered its name from the local description of Lulubog-Lilitaw, thus, shorted as LuLi, which means sinks and arises. During low tide, its sand bar is visible while on high tide it sinks underwater leaving only the houses on it are visible, most often in the afternoon. My youngest daughter made it to the diving place! Yey! The bouy floating around the beach signify the safe boundary for everyone to swim to or to snorkel. Beyond that boundary is already more than 10 feet deep. We spent an hour snorkeling and swimming at Luli Island. Here at Starfish Island, we stayed a lot longer. Look at that super clear and blue sky...Noticeable to that the beach is very clean, though a bit rocky on some shoreline. The sand is still white and the water crystal clear. Funny, they call this island as starfish. These are the only starfishes that we saw. According to the boatmen, the island is really a starfish inhabitant but at certain moments they stay below the deep parts of ocean bed. Coral watching and fish-feeding was way better at Luli, but make sure to come there early or you mind only see 30% of the whole sandbar. My girls resorted to looking for unusually-shaped shells and stones. "Look Mom! I caught me some starfishes." On the other side of the island are rows upon rows of mangroves. These mangroves are nesting grounds for fish and the note-worthy "tamilok" or mangrove wood worms. Starfish Island is one of the longest sand bar in Honda Bay. On the beach side where tourists are being dropped off are rows of nipa huts. It is there where we had one of the sumptuous lunch our family had at Puerto Princesa. 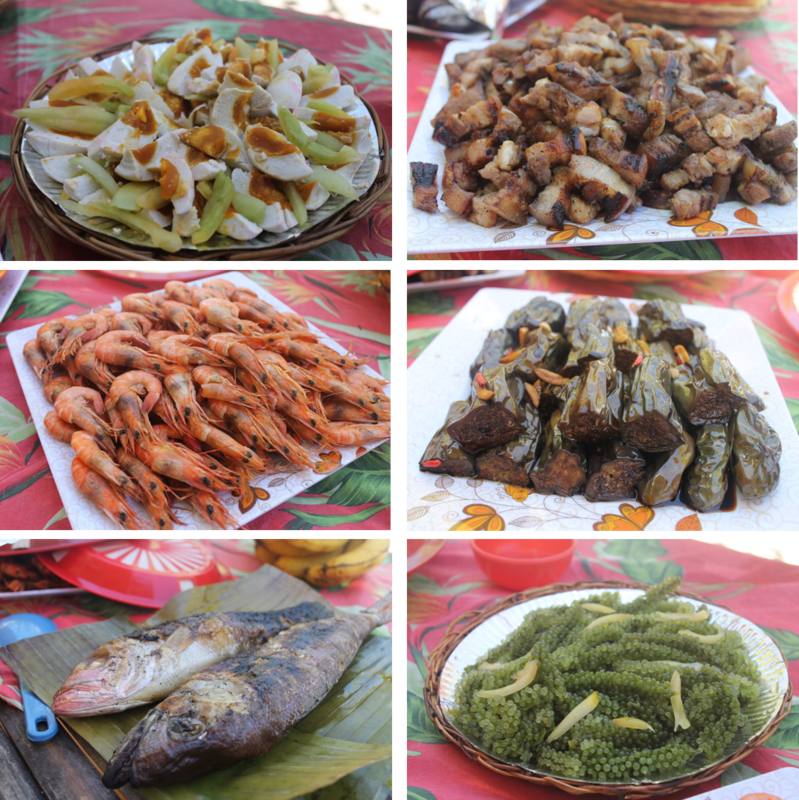 Prepared by our tour guide, Ms. Emily with the help of the boatmen, our table was a spread of grilled fish, pork and eggplants, salted eggs, raw mangoes, seaweeds, steamed large shrimps. The lunch fee was included in the Honda Bay tour package. Third and last island to visit is the Cowrie Island. There are more islands actually, in rare tour cases, five islands can be visited in one day. More and more people are loving Honda Bay that they decided to buy the islands and turn in it into a private resort. The view from a far, while we are all getting giddier. Ahhh...look at that fine ivory sand being hugged by the calm, clear majestic sea water. It was also the longest route we had, a 15-minute boat ride from Starfish island, so when we arrived we just occupied a hut with long benches just to breathe-in all the beauty that abounds. No words and photos can do justice in the describing and capturing the island's beauty. A few meters away from where I'm seated, I saw these beach huts, where spa and massage services are being offered. One best way from easing your exhausted body from all the cruising and swimming is to get a relaxing massage. But of course, as much as I want, I need to look after my two younger girls. So instead of having a massage, I asked hubby and the kids to do some jumps while I capture the background that is just so breath-taking. Alright, how about these from the girly bunch? And, why not another turn from these sibling. That's our outrigger out there. Other tourists prefer to have lunch here. There are several restaurants here, after all. Wow, I want to go to Palawan soon, that starfish is really cute! You have a beautiful family Joy! greenvisa.io site you'll have to take what remained, and what remained is unfortunately not the best that could be. Thanks for sharing Palawan Tour guide with us, palawan is dubbed as the Philippines’ last frontier which is also one of the largest island province of the country and just recently it has been awarded as the best island in the world. one day agra tour best tour package for those who thinking to visit agra in one day. Thanks ankur sharing for more information about palawan tour. Same day agra tour is good for visit taj mahal but Golden Triangle Tour 3 Days is the best tour. Thanks for sharing these all wonderful photographs of this amazing island, I wants to visit this place once in my life. because now i am thinking to visit Agra City Historical Monuments, And successfully booked car rental in agra service. Hiring a movers and packers company is the best decision when you have to relocate. But it comes with a price. At times, the cost of hiring professional packers vishrantwadi is way more than what your actual budget is. Wonderful experience, these all images looking so beautiful that you have captured while palawan tour., Great guide keeps updating. Palawan is known as one of the beautiful island in the world. Tourists from different parts of the world visit this haven and paradise island in the Philippines. Wonderful destination to visit, Palawan Island Philippines is famous for white beaches, clear water and amazing biodiversity, also for Puerto Princesa Underground River. If you are planning to Tour Travel Hotels to Thailand you have many choices in the way of hotels. Weather you want modern conveniences and state of the art technology, or do you want to stay somewhere with rich historical value, there is a place for you in Thailand. I have read your full post and I want to say that this is a very nice post. Its really enjoyable and stunning photos you shared thanks for sharing this post with us. Good guide!! thanks for sharing this wonderful tour guide with us, i really glad to read your tour. If you want to visit Agra City then book a tour package. It looks that you had a great time in Honda Bay and you have shared a nice post on your travel experience. If you want home moving to be stress-free, you should contact a professional packers kharadi pune company. There are many movers and packers that provide secure and economical services. Great island to spend holiday. There are really as many type of look at this site as there are people. Here we take a tongue-in-cheek look at some of the common types of people.